Urticaria (or hives) is a skin condition, commonly caused by an allergic reaction, that is characterized by raised red skin wheals (welts). It is also known as nettle rash or uredo. Wheals from urticaria can appear anywhere on the body, including the face, lips, tongue, throat, and ears. The wheals may vary in size from about 5 mm (0.2 inches) in diameter to the size of a dinner plate; they typically itch severely, sting, or burn, and often have a pale border. Urticaria is generally caused by direct contact with an allergenic substance, or an immune response to food or some other allergen, but can also appear for other reasons, notably emotional stress. The rash can be triggered by quite innocent events, such as mere rubbing or exposure to cold. The skin lesions of urticarial disease are caused by an inflammatory reaction in the skin, causing leakage of capillaries in the dermis, and resulting in an edema which persists until the interstitial fluid is absorbed into the surrounding cells. Urticarial disease is thought to be caused by the release of histamine and other mediators of inflammation (cytokines) from cells in the skin. This process can be the result of an allergic or non-allergic reaction, differing in the eliciting mechanism of histamine release. Histamine and other pro-inflammatory substances are released from mast cells in the skin and tissues in response to the binding of allergen-bound IgE antibodies to high affinity cell surface receptors. Basophils and other inflammatory cells are also seen to release histamine and other mediators, and are thought to play an important role, especially in chronic urticarial diseases. Mechanisms other than allergen-antibody interactions are known to cause histamine release from mast cells. Many drugs, for example morphine, can induce direct histamine release not involving any immunoglobulin molecule. Also, a diverse group of signaling substances called neuropeptides have been found to be involved in emotionally induced urticaria. Dominantly inherited cutaneous and neurocutaneous porphyrias (porphyria cutanea tarda, hereditary coproporphyria, variegate porphyria and erythropoietic protoporphyria) have been associated with solar urticaria. The occurrence of drug-induced solar urticaria may be associated with porphyrias. This may be caused by IgG binding not IgE. The rash that develops from poison ivy, poison oak, and poison sumac contact is commonly mistaken for urticaria. This rash is caused by contact with urushiol and results in a form of contact dermatitis called Urushiol-induced contact dermatitis. Urushiol is spread by contact, but can be washed off with a strong grease/oil dissolving detergent and cool water. Acute urticaria usually show up a few minutes after contact with the allergen and can last a few hours to several weeks. Food allergic reactions typically fit in this category. Common causes of reaction include consumption of shellfish, nuts, eggs, fish, acid derivatives, dye, or a combination of these. A less common cause is exposure to certain viruses or bacteria, such as streptococcus or possibly Helicobacter pylori(Tebbe B, Geilen CC, Schulzke JD, Bojarski C, Radenhausen M, Orfanos CE. Helicobacter pylori infection and chronic urticaria. J Am Acad Dermatol. Apr 1996;34(4):685-6). In these cases, the hives may be exacerbated by other factors, such as those listed under Physical Urticarias below. Chronic urticaria refers to hives that persists for 6 weeks or more. There are no visual differences between acute and chronic urticaria. Some of the more severe chronic cases have lasted more than 20 years. A survey indicated that chronic urticaria lasted a year or more in more than 50% of sufferers and 20 years or more in 20% of them. Of course this does mean that in almost half the people it clears up within a year and in 80% it clears up within 20 years or less. Drug-induced urticaria has been known to result in severe cardiorespiratory failure. The anti-diabetic sulphonylurea glimepiride (trade name Amaryl®), in particular, has been documented to induce allergic reactions manifesting as urticaria. Other cases include dextroamphetamine, aspirin, penicillin, clotrimazole, sulfonamides and anticonvulsants. Physical urticarias are often categorized into the following. Angioedema is not related to urticaria. In angioedema, the swelling occurs in a lower layer of the dermis than it does in urticaria, as well as in the subcutis. This swelling can occur around the mouth, in the throat, in the abdomen, or in other locations. Urticaria and angioedema sometimes occur together in response to an allergen and is a concern in severe cases as angioedema of the throat can be fatal. Urticarias can be very difficult to treat. There are no guaranteed treatments or means of controlling attacks, and some sub-populations are treatment resistant, with medications spontaneously losing their effectiveness and requiring new medications to control attacks. It can be difficult to determine appropriate medications since some such as loratadine require a day or two to build up to effective levels, and since the condition is intermittent and outbreaks typically clear up without any treatment. Most treatment plans for urticaria involve being aware of one’s triggers, but this can be difficult since there are several different forms of urticaria and people often exhibit more than one type. Also, since symptoms are often idiopathic (unknown reason) there might not be any clear trigger. If one’s triggers can be identified then outbreaks can often be managed by limiting one’s exposure to these situations. Drug treatment is typically in the form of Antihistamines such as diphenhydramine, hydroxyzine, cetirizine and other H1 receptor antagonists. These are taken on a regular basis to protective effect, lessening or halting attacks. While the disease is obviously physiological in origin, psychological treatments such as stress management can sometimes lessen severity and occurrence. Additionally, methods similar to psychological pain management can be used to shift focus away from the discomfort and itchiness during an attack. The H2-receptor antagonists such as cimetidine and ranitidine may help control symptoms either prophylactically or by lessening symptoms during an attack. When taken in combination with a H1 antagonist it has been shown to have a synergistic effect which is more effective than either treatment alone. The use of ranitidine (or other H2 antagonist) for urticaria is considered an off-label use, since these drugs are primarily used for the treatment of peptic ulcer disease and gastroesophageal reflux disease. Tricyclic antidepressants such as doxepin, also are often potent H1 and H2 antagonists and may have a role in therapy, although side effects limit their use. For very severe outbreaks, an oral corticosteroid such as Prednisone is sometimes prescribed. However this form of treatment is controversial because of the extensive side effects common with corticosteroids and as such is not a recommended long-term treatment option. As of 2008 an Australian company is performing clinical trials with an analogue of alpha-melanocyte-stimulating hormone called melanotan (known by the International Nonproprietary Name afamelanotide, formerly CUV1647) for the treatment of solar urticaria, a type of urticaria that develops in response to exposure to specific wavelengths of light. Children with intermittent or recurrent urticaria-angiodema were fed 7 food-additives: tartrazine (E102), sunset yellow (E110), erythrosine (E127), annatto (E160b), sodium benzoate (E211), acetyl-salicylic acid (ASA) and aspartame. Reactions to the food additives were common: E110 = 64%, E160b = 60%, E211: 57%; E102 = 50%, aspartame = 48%, E127 = 35%, ASA = 12%. The authors suggest that food additive intolerance is frequent in children with recurrent or intermittent urticaria-angiodema, and that aspartame may contribute directly to urticaria-angiodema in childhood. Acon., agar., all-c., am-c., am-m., anac., ant-c., ant-t., anthro., antipyrin., ap-g., apis., arn., ars., ars-i., astac., aur., bar-c., bar-m., bell., benz-ac., berb., bomb-pr., bov., bry., bufo., calad., calc., calc-s., camph., carb-an., carb-ac., carb-s., carb-v., caust., cham., chin., chin-a., chin-s., chlol., chlor., cic., cimic., coca., cocc., con., cop., corn., crot-h., crot-t., cub., cund., cupr., dulc., dys-co., elat., fago., ferr-i., frag., gall-ac., galph., graph., hep., hist., hom., hydr., ichth., ign., iod., ip., kali-ar., kali-br., kali-c., kali-chl., kali-i., kali-p., kali-s., kreos., lach., led., lyc., lycps., mag-c., medus., merc., mez., nat-a., nat-c., nat-m., nat-p., nit-ac., nux-v., pall., petr., ph-ac., phos., polyg., psor., puls., rhus-t., rhus-v., rob., rumx., ruta., sal-ac., sanic., sars., sec., sel., sep., sil., skook., stann., staph., stram., stroph., stry., sulph., sul-ac., sul-i., ter., tet., thuj., til., trio., tub., urt-u., ust., valer., vario., verat.,vesp., zinc. ^ Champion RH, Roberts SO, Carpenter RG, Roger JH (1969). “Urticaria and angio-oedema. A review of 554 patients”. Br. J. Dermatol. 81 (8): 588–97. PMID 5801331. ^ “Prescribing Information Dexedrine“. GlaxoSmithKline (June 2006). 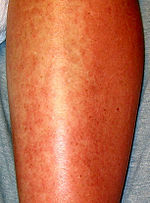 ^ “Hives (Urticaria and Angioedema)” (2006-03-01). Retrieved on 2007-08-24. ^ Greaves MW, Tan KT (2007). “Chronic Urticaria: Recent Advances”. Clin Rev Allergy Immunol 33 (1-2): 134–143. doi:10.1007/s12016-007-0038-3. PMID 18094952. ^ Lee EE, Maibach HI (2001). “Treatment of urticaria. An evidence-based evaluation of antihistamines”. Am J Clin Dermatol 2 (1): 27–32. PMID 11702618. ^ “World Health Organisation assigns CUV1647 generic name” (PDF). Clinuvel (2008). Retrieved on 2008-06-17. ^ McDonald, Kate (2007-04-13). “Tackling skin cancer in organ transplant patients“. Australian Life Scientist. Retrieved on 2007-12-24. ^ “Clinuvel gets green light“. Biotechnews.com.au (LifeScientist) (2007-06-11). Retrieved on 2008-06-13. ^ Baron, ED; Taylor, CR (2007-03-29). “Urticaria, Solar“. WebMD. Retrieved on 2007-12-26.